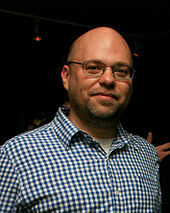 Adam Davidson (born 1970) is an American journalist focusing on business and economics issues for National Public Radio. He was a co-founder of NPR's Planet Money program. Previously he has covered globalization issues, the Asian tsunami, and the war in Iraq, for which he won the Daniel Schorr Journalism Prize. He and Adam McKay were former co-hosts of Surprisingly Awesome from Gimlet Media. Davidson worked as an economics columnist for The New York Times Magazine and in 2016 took a position at The New Yorker. Davidson attended college at the University of Chicago, graduating in 1992. Davidson won the George Polk Award in Radio Reporting for his reporting with Alex Blumberg for a May 2008 show titled "The Giant Pool of Money". The piece explained the highly complex chain of events that led to the subprime mortgage crisis by showcasing interviews with participants at each sector of the crisis. The episode was linked widely in the blogosphere and remains one of the show's most-downloaded podcasts. Davidson, Adam (April 13, 2016). "Bernienomics might not be feasible—but it's useful". The New York Times Magazine. — (March 13, 2017). "Donald Trump's worst deal : the President helped build a hotel in Azerbaijan that appears to be a corrupt operation engineered by oligarchs linked to Iran's Revolutionary Guard". A Reporter at Large. The New Yorker. 93 (4): 48–57. — (April 14, 2018). "Michael Cohen and the End Stage of the Trump Presidency". News Desk. The New Yorker. ^ "Surprisingly Awesome". Gimlet Media. Retrieved 2016-08-26. ^ "Adam Davidson: NPR". National Public Radio. Retrieved January 5, 2009. ^ "Bernienomics Might Not Be Feasible — But It's Useful". The New York Times Magazine. Retrieved April 25, 2016. ^ Bazelon, Emily; Davidson, Adam; Plotz, David (2016-08-26). "The "Meet the New Trump" Edition". Slate. ISSN 1091-2339. Retrieved 2016-08-26. ^ Li, Eileen; Davidson, Adam (January 18, 2016). "Uncommon: Richard Thaler and Adam Davidson". Maroon. Retrieved January 18, 2018. ^ Online version is titled "The Economic Lessons of the Stink Highway". ^ Online version is titled "Trump's business of corruption".